April showers bring May Flowers… or so the saying goes. April has just begun and we want to celebrate with style. We’ve got new fun products for this month including arm warmers, scarves and purses of all shapes and sizes! All our designs are made upcycling fabric or products already in existence. We pride ourselves on being eco-friendly as well as innovative, trying to come up with new, fresh, inspired ideas everyday! I hope you like our new products for this month. We also have a piece or two on sale for you, so don’t miss out!! 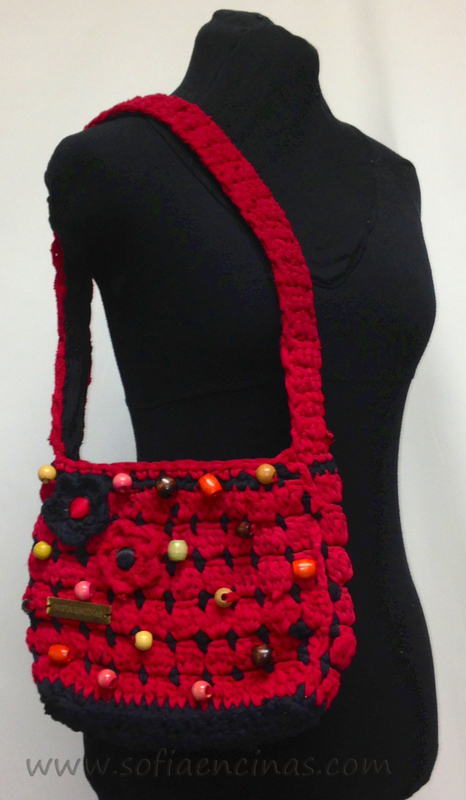 This first piece is a Black and Red Beaded Purse Crocheted with Upcycled T-shirts. 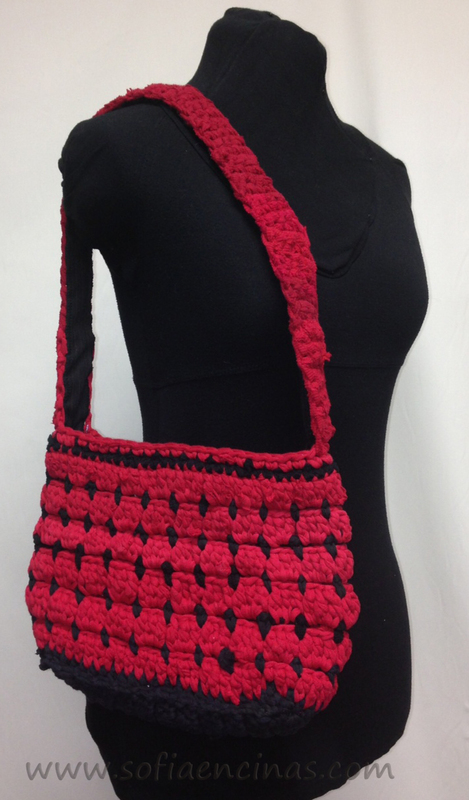 This fun crocheted purse is bright and vibrant enough to ward off the rain this season. 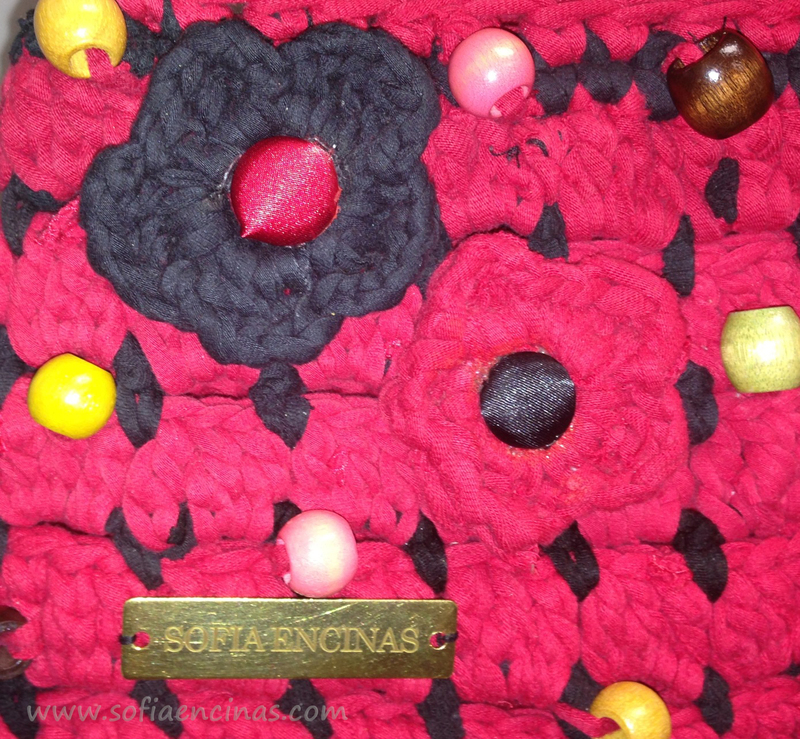 Detailed with vintage wooden beads on the front and crocheted flowers with satin covered buttons in the center. The purse is crocheted out of upcycled t-shirts (for more information on how this technique is done please our post How to Make Your Own Thread out of T-Shirts). The lining of the purse was taking from a suit jacket and has a slight reddish pink pinstripe and closes with a magnetic button. Click Here to buy! 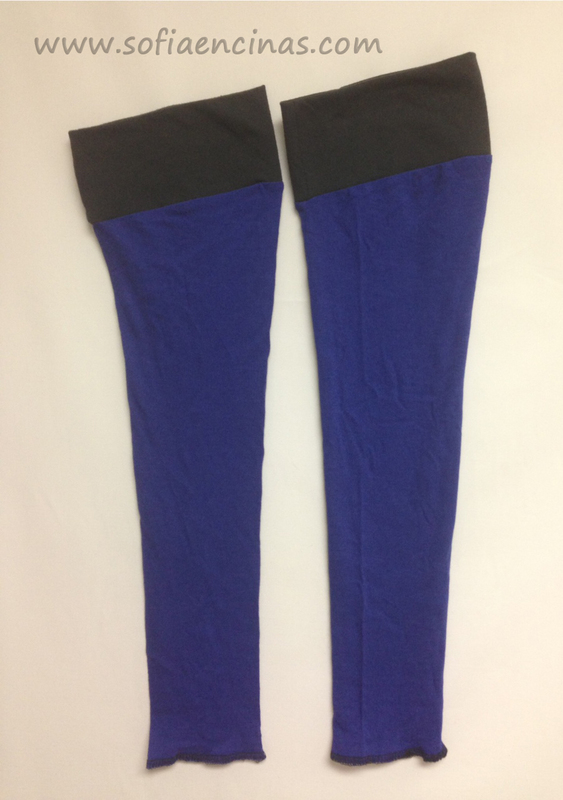 The next piece is a Blue and Black Neck Wrap with Matching Arm Warmers. This beautiful scarf and arm warmer combo is the perfect way to brush of the cold and start the rainy season with the right attitude. 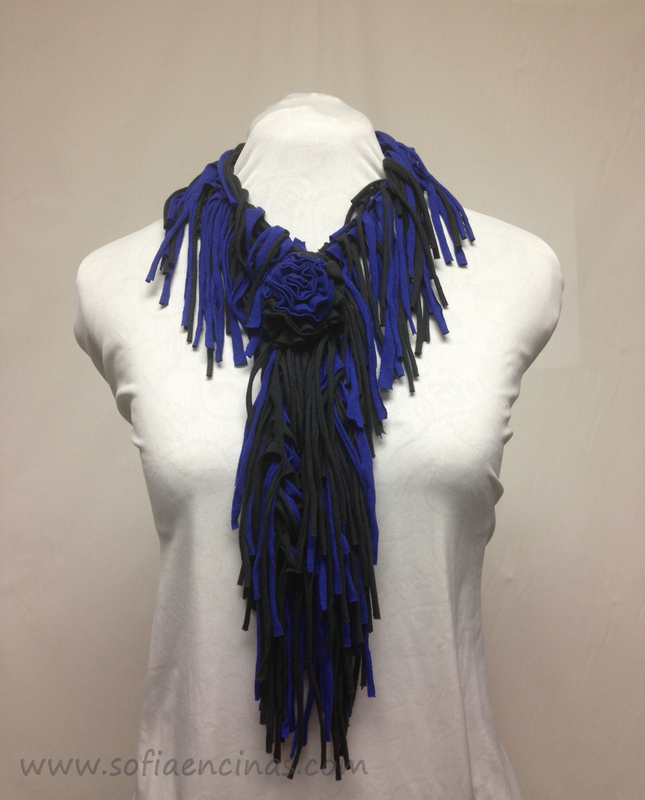 It 5 inch long tassels, this scarf can be worn open like a necklace, or closed as seen above. It is completely upcycled from a blue and black t-shirt, and is 100% eco-friendly. 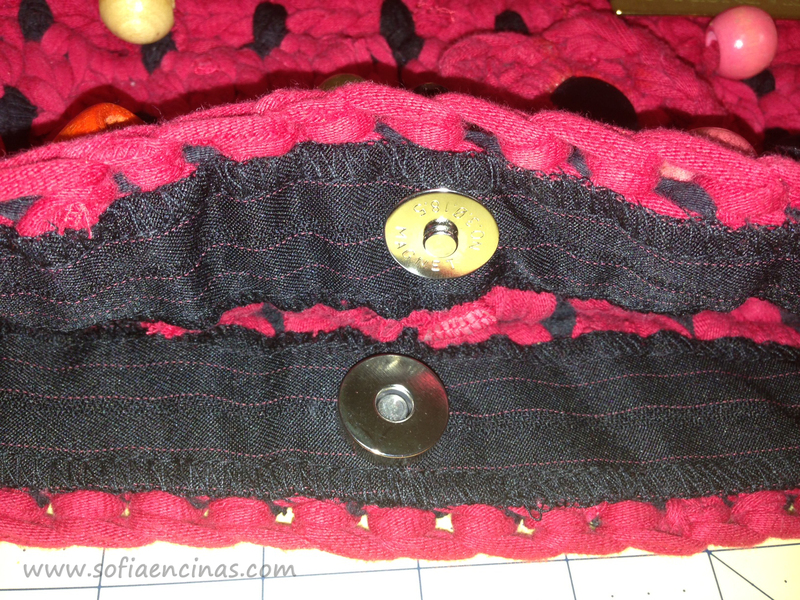 The flower detail is also made out of t-shirts and can be used to close the scarf together giving it a very unique look as seen above. The arm warmers are 11 inches wide at the bicep and 7 inches wide at the wrists. This duo comes as a set, but both piece can be worn separately! 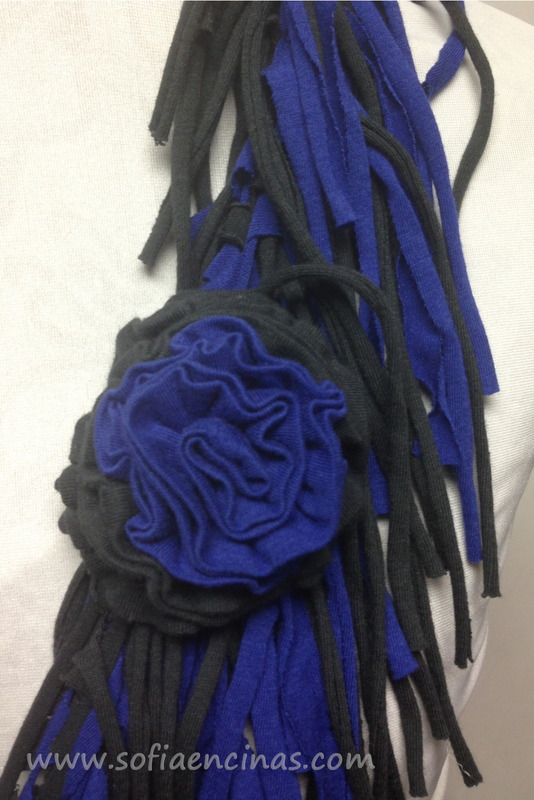 The black and blue combo perfect for any event or outing! Click Here to buy! 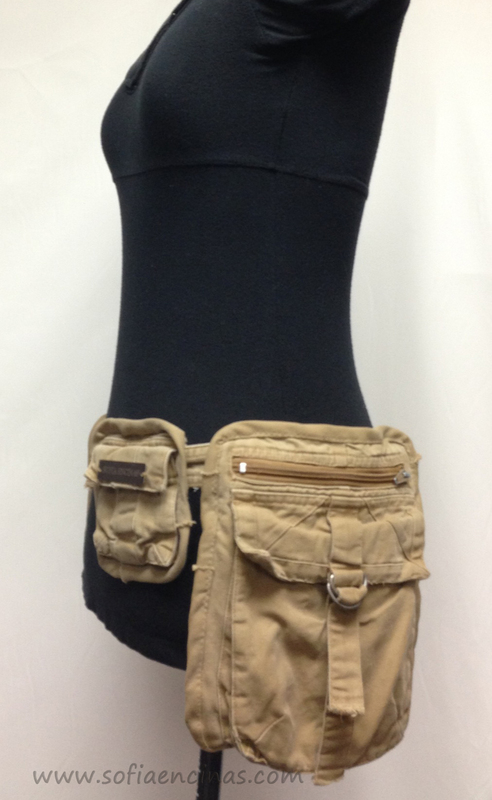 The next piece is a Upcycled Cargo Pants Fanny Pack. 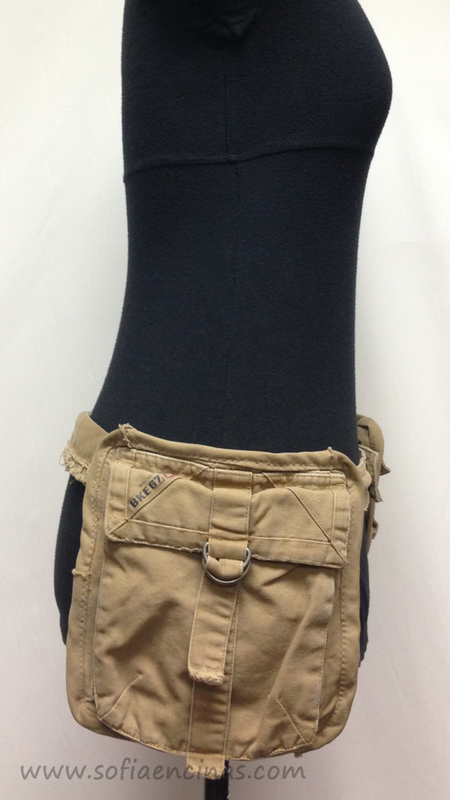 What a great way to reuse those cargo pants pockets!! This fanny pack definitely won’t make you look stuck in the 80’s when you are traveling, at a theme park, hiking a mountain or running errands. 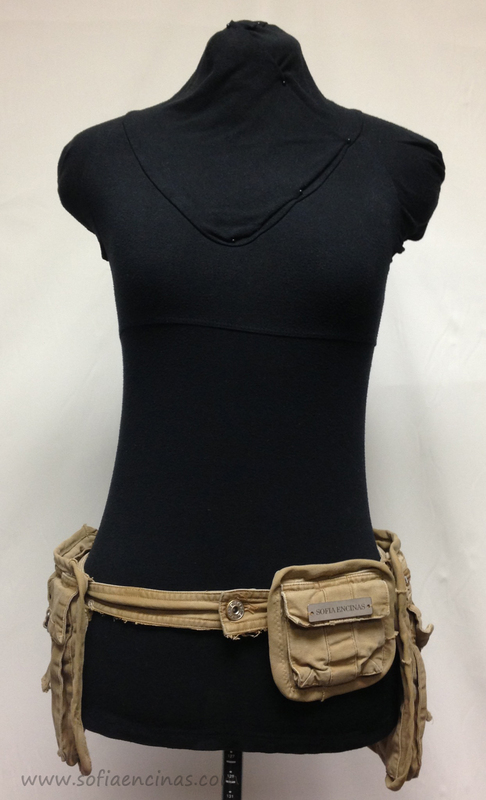 With 3 movable and removable pockets in two different sizes, diversity is limitless. 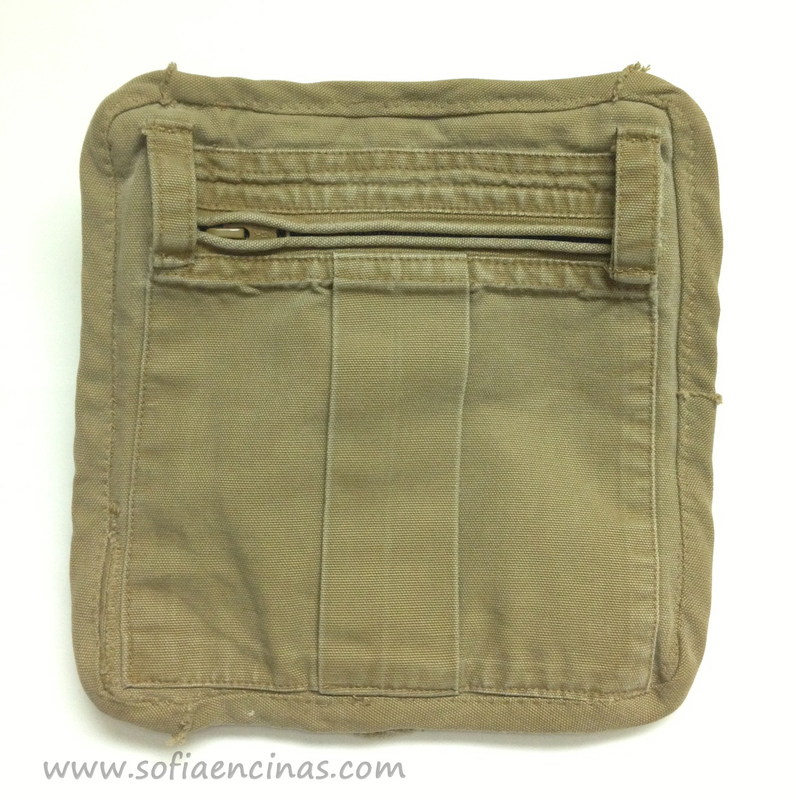 The large pockets both contain secret hidden zipper compartments on the body side of the pocket for security. 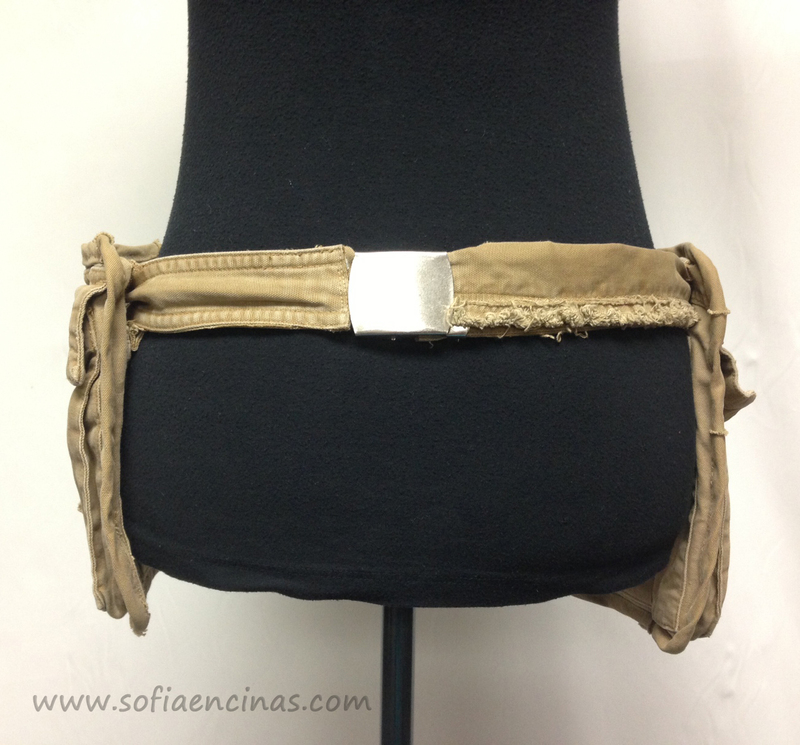 There is an adjustable belt buckle in the back and a pants button closure in the front in order to fit any body type. This is a fun and practical way to kickoff spring and start gearing up for the summer months! Click Here to buy! Last but not least is our monthly sale item! 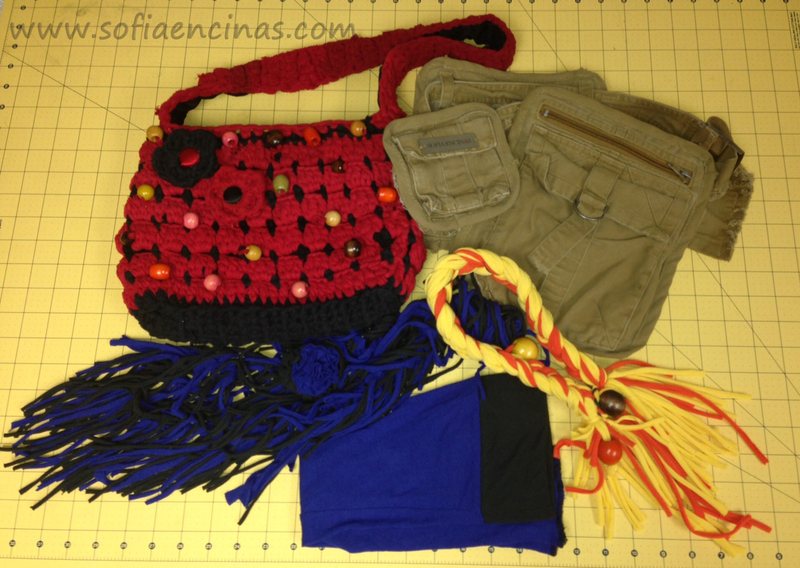 An Orange and Yellow Beaded Scarf/Necklace Made from Upcycled Crocheted T-Shirts. a necklace that will set you apart from the rest! The style and statement that you will make wearing this piece to accentuate any outfit is incredible. Made out of recycled t-shirts, this necklace has vintage wooden beads throughout the braid and uses a wooden bead closure in the front to bring the necklace together. The neckline measures 19 inches and is stretchy!! Originally $36.00 this fun necklace is now on sale for only $30.00 in our Etsy Store NOW! Click Here to Buy!! Please feel free to give suggestions, thoughts, comments, questions in the comments below! GET CREATIVE! This entry was posted in New Products! and tagged 2015, activity, comments, crafts, creative, eco-friendly, family friendly, fanny pack, purse, questions, recycle, Recycling, sale, scarf, special, style, unique, upcycle, upcycling.